Over the course of its 15 years of operation, JetBlue Airways has been constantly growing. 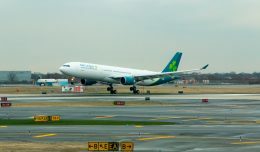 With that growth has come an ever-changing terminal experience at John F. Kennedy International Airport (JFK), the airline’s home base. Initially, the carrier used Terminal 6, the former National Airlines Sundrome. The classic I. M. Pei designed terminal had seen more than its share of tenants over the years. By the time JetBlue took up residency there, it was significantly dated. The airline needed something new and modern to better fit its image and customer-focused nature. In 2005, JetBlue and the Port Authority of New York and New Jersey (PANYNJ) began construction on an new terminal, located behind the historical (and landmarked) TWA Flight Center. Dubbed T5 (short for Terminal 5), the Gensler-designed structure opened on October 22, 2008. When it opened, T5 contained 26 gates, room for 20 security checkpoint lanes, and a plethora of dining and shopping experiences. However, there was one thing missing from the new terminal: The ability to accept JetBlue’s non-precleared international arrivals. JetBlue began flying international flights on June 10, 2004. The first international route was between JFK and Santiago, Dominican Republic. Flights to Santo Domingo soon followed. Today, the airline is a major presence in the Caribbean, and it also operates flights to destinations in Central and South America. JetBlue currently flies to 25 international destinations, with more planned to start as soon as next month. 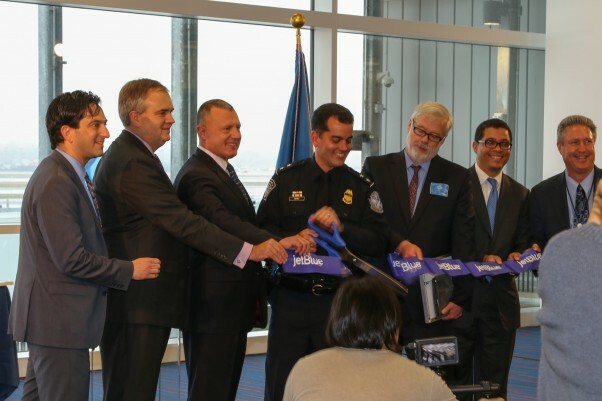 JetBlue will have up to 39 daily international arrivals when T5i opens, and plans are in the works to add at least three more by the end of 2015. From the very beginning, these international arrivals (with the exception of precleared flights from Aruba, the Bahamas, and Bermuda) have had to use JFK’s Terminal 4. That terminal houses a Federal Inspection Station (FIS) which is required for international arrivals. This posed something of a problem for the customer-centric airline. 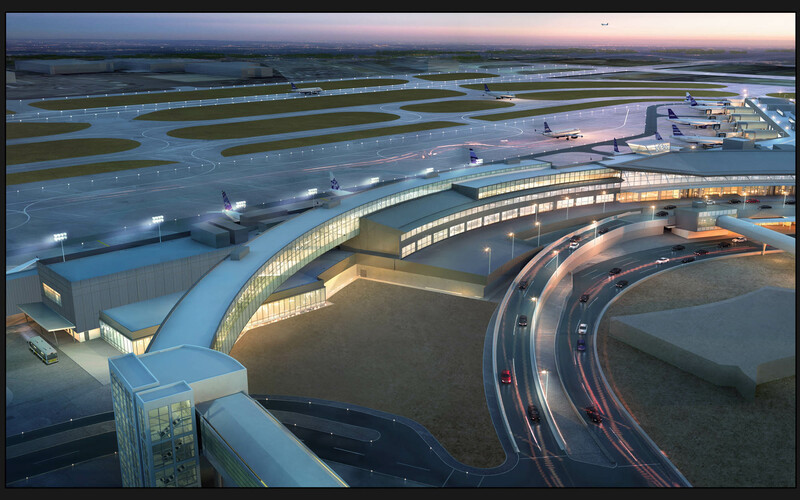 After a flight where a strong emphasis was placed on the passenger experience, customers would have to endure clearing US Customs and Immigration at the one of the airport’s major international terminals. Depending on your luck, that might mean standing behind an A380 or two’s worth of passengers waiting to be admitted into the country. 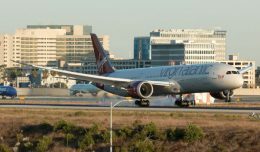 And for connecting passengers and crew members who might have another flight to operate, it meant having to transit between terminals 4 and 5. Clearly, JetBlue needed a better solution for its growing ranks of passengers arriving on international flights. 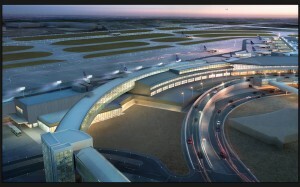 On May 31, 2012, the airline received the green light from the PANYNJ Board of Commissioners to construct an international arrivals facility at T5. Ground was broken on October 1, 2012 on the roughly 175,000 square foot extension. The three new gates of T5i. The new terminal extension includes three new gates, as well as three existing gates that have been renovated to accommodate international arrivals. 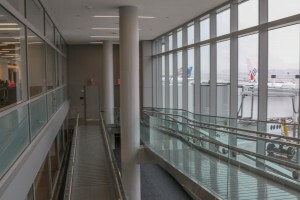 The three-story addition features a glass-walled international arrivals hall, designed to bring natural light into an area that is normally windowless. 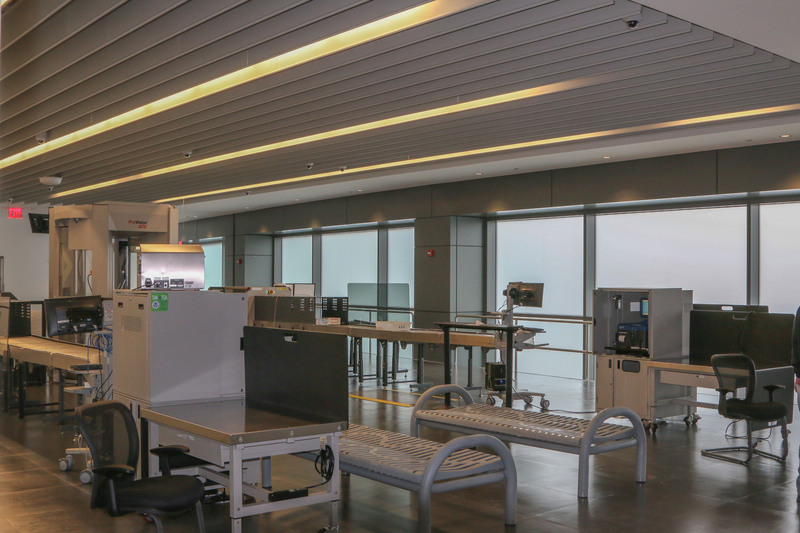 The Federal Inspection Station is capable of processing 1,400 passengers per hour, the equivalent of more than nine of the airline’s A320s. 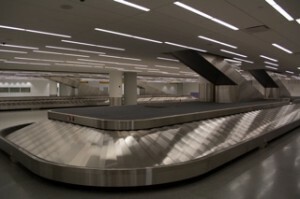 As part of the FIS, an additional 2 baggage claim carousels have been installed. Special attention has been paid to the efficiency of the terminal extension, both in terms of energy and passenger movement. The facility has been designed to minimize its environmental impact over the course of its lifespan. This includes a performance-optimized HVAC system and low flow water fixtures. Even the concrete used during construction is environmentally friendly. The portions of the concrete apron that were removed as part of this project were ground up to be used as the base for the new concrete. Maximizing the efficiency of passenger movements was also a key goal of the new facility. the new customs facility was designed to minimize walking and the amount of travel time needed. 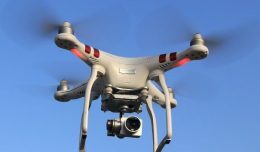 This will allow the airline to offer shorter connections to passengers. It is easy to tell when you are entering the new section of T5: Just past Gate 25, there is a gentle incline upwards towards the new gates. This incline is necessary in order to locate the FIS underneath the main passenger terminal area. Upon reaching the top of the ramp, the Gates 26 and 27 are immediately to your right. Gate 28 is in the middle of the new section, with Gates 29 and 30 adjacent to each other at the end. Opposite the gates are a variety of dining and shopping establishments, further expanding T5’s already extensive selection. This includes the first airport location for famed East Village Winebar, Bar Veloce, as well as New York Minute, a store selling only locally produced products. At opening, T5i will have four new shopping and dining experiences, with a further two still under construction. All along the length of the newly built area are walls of windows, providing an excellent view of airport operations. While AvGeeks might lament the double layer of windows in much of the new section between the waiting areas and their aircraft, they are necessary for the efficient movement of passengers in and out of the terminal. When boarding, passengers will have their boarding pass scanned, after which they will proceed down a ramp to their flight’s jetbridge. 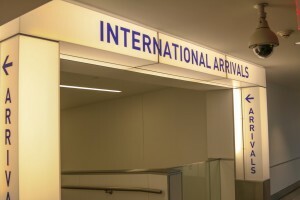 On an international arrival, passengers would be directed to continue down the ramp to the bottom, where they would enter a hallway leading towards the FIS. Like the rest of T5i, This area makes extensive use of glass to allow plenty of natural light in. In the middle of the terminal, arriving passengers will make a well marked turn and proceed down another set of ramps down to ground level. 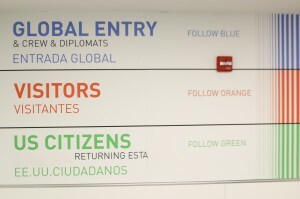 Halfway down the ramp is a large sign directing passengers to the appropriate line: Blue for members of the Global Entry program, crew, and diplomats, Orange for visitors from other nations, and green for US Citizens, Permanent Residents, and returning visitors who have used the Electronic System for Travel Authorization (ESTA). Continuing down, the ramp leads directly into the expansive passport control area. The center of this area is filled with the familiar queues necessary for managing the crowds. most of these lead to the bank of nearly 20 passport control booths. These can be assigned as needed in order to serve various types of arriving passengers. Immediately to the left when entering the passport control area is a bank of 10 Global Entry kiosks. On the far side of the room, the airline has purchased and installed 40 state-of-the-art Automated Passport Control (APC) kiosks. 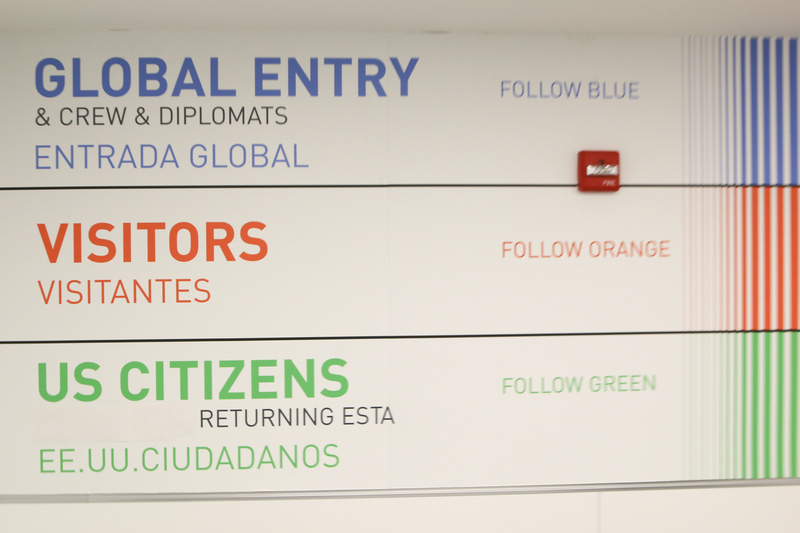 These kiosks electronically process the passports of citizens of the United States and Canada, as well as eligible visitors from Visa Waiver Program countries. 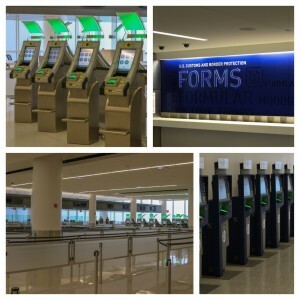 To use these kiosks, travelers scan their passport, answer a series of biographic questions, and electronically complete their customs declaration forms. A photo is taken, and then a receipt is printed out which indicates whether or not the traveller has been selected for further screening. Travelers show this receipt as their ‘ticket’ out of passport control. Use of the APCs is free of charge. 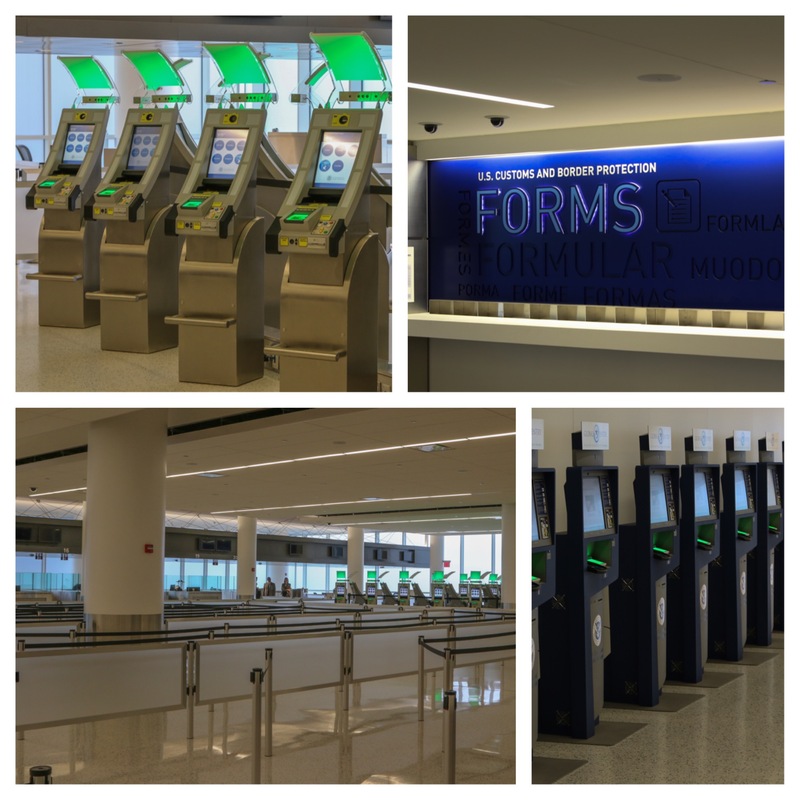 The greatly increased efficiency in the passport control process that the kiosks bring has increased the capacity of the FIS from the originally planned 1,200 passengers per hour to 1,400 passengers per hour. Next, travelers enter the new baggage claim area, retrieve any checked bags, and then clear Customs. Customers whose travels end in New York or who are connecting to other terminals exit out to the existing arrivals area. However, those who are connecting to another flight at T5 head back upstairs. 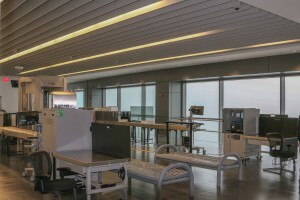 There, a dedicated TSA area just for connecting passengers provides the required screening without them having to pass through the main checkpoint area. This screening area exits into T5i across from Gate 26, right at the top of the ramp. Gates throughout the terminal can be accessed from there within five minutes of walking. 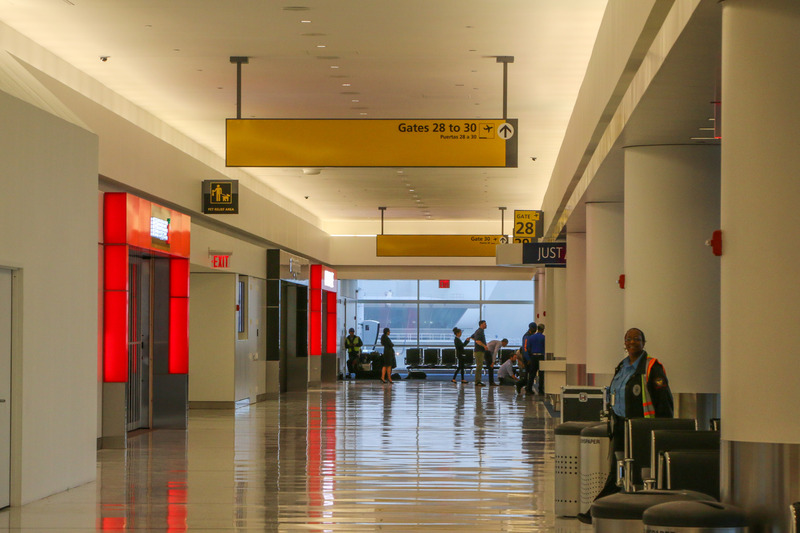 Due to Jet Blue’s operational needs at JFK and the reconstruction of 3 existing gates to be capable of handling international arrivals, T5i will initially open with only 5 gates available. 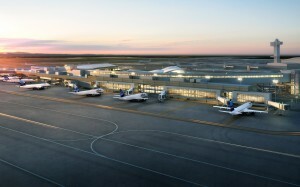 Gate 25, the closest gate to the existing terminal, was needed for the airline’s operations this summer. As a result, it was only closed recently for reconstruction. 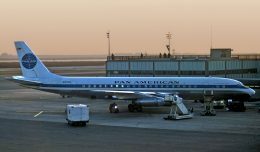 The airline expects the renovation to be complete in the coming months. Additional features will open over the course of the next six to nine months. The first of these is an interactive Science, Technology, Engineering, and Math area for kids, which is slated to open before the end of the year. Meanwhile, next spring will see the opening of a post-security rooftop park area, as well as a dog walking area that is also inside the sterile area. 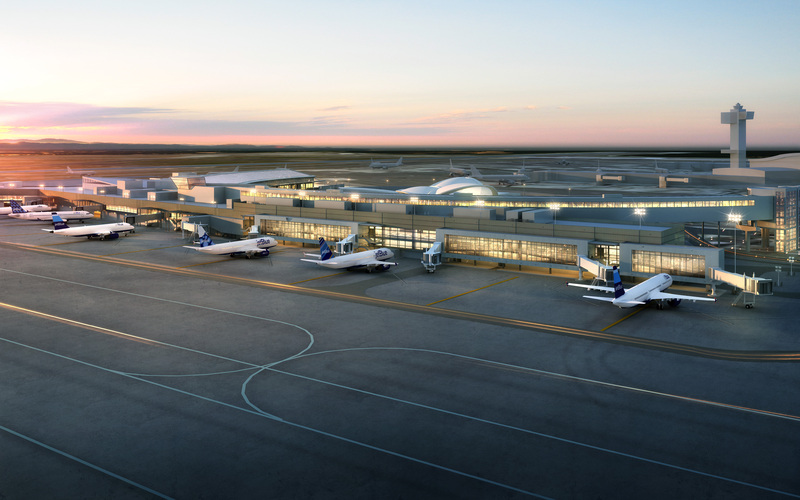 All told, T5i marks the logical next step forward for the airline and its home airport. The modern new section perfectly complements the existing terminal, while adding necessary functionality in a way that only customer focused JetBlue could manage.